So you’ve booked your flights and now you’re on the hunt for Barcelona apartments for rent! Depending on your needs, you may choose a short term rental (rented by the day) or a long term rental (rented by the month). As a foreigner, if you’re looking for an apartment for rent over one month, but under three months, it can be a bit of a sticky situation if you go to a certain agencies. The main reason for this is the amount of upfront cash they require, which can normally be: one month for deposit, two months rent in advance, plus the payment of another month as an agency fee, which is a lot of cash to cough up! 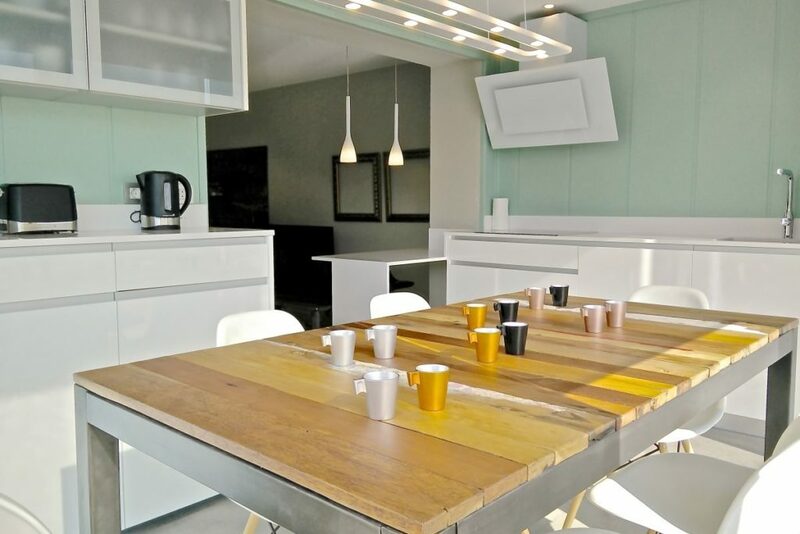 Here at BizFlats, we are proud to offer you quality apartments located across Barcelona city, with flexible rental terms, that can be booked online easily. 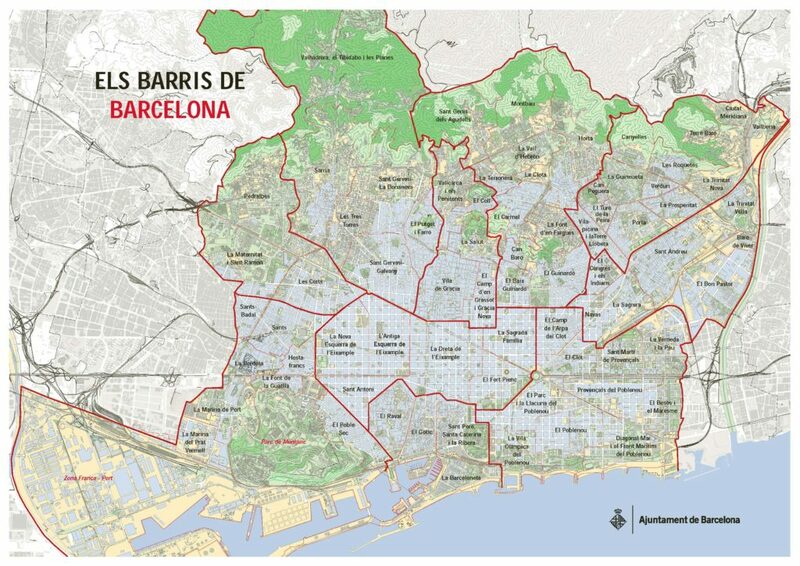 If you want to know what are the “must haves” for rental apartments in Barcelona, click here. 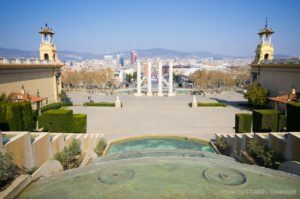 Keep reading for our handpicked recommendations for Barcelona apartments for rent – long term and short term! Close to La Fira de Barcelona and the Barcelona Sants train station, this complex boasts a total of 10 apartments and 2 new duplexes, plus a big communal terrace that can be enjoyed by residents. 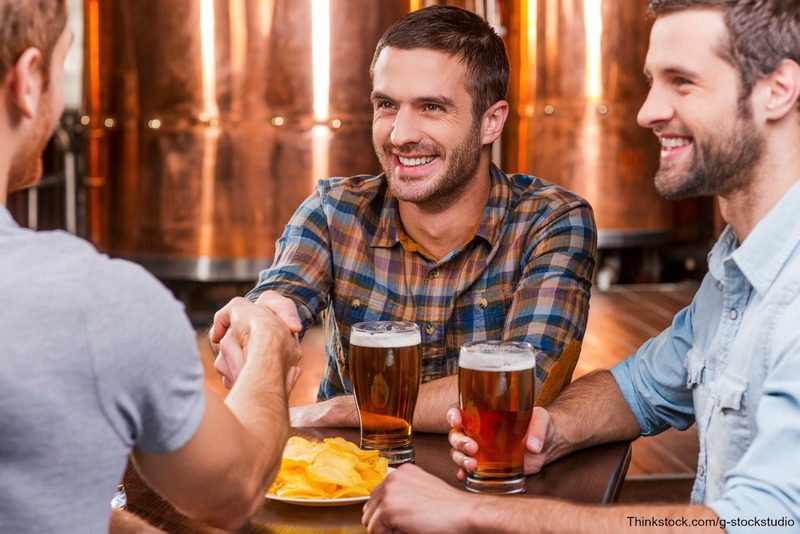 Just 15 minutes away from the airport, The Milliways Complex has 20 identical executive-style apartments, all equipped with free wifi and twin bedrooms, making it the perfect place to stay for corporate groups and trade show groups. A three-bedroom luxury apartment located in the upscale neighbourhood of Eixample, just one block away from Passeig de Gràcia, and surrounded by La Pedrera and La Casa Batlló. Fitted with leather and mahogany furniture, mosaic-titled flooring and balconies, Dandi aparment is the epitome of culture, class and Modernism. This makes it a really good option if you’re looking to splurge on a memorable holiday. A charming apartment furnished with original furniture and oil paintings from South Africa, Livingstone has two double bedrooms and two full bathrooms, plus fully furnished kitchen and fiber optic internet to ensure a comfortable stay. Just one minute away from Passeig de Gràcia, where the most elegant shops and boutiques are located, such as Gucci, Armani and Chanel. Plus all the restaurant and nightlife destinations with even more glamour to keep you busy. Feet sore after a long day of shopping? Have a soak in the whirlpool tub in La Mimosa apartment, the perfect apartment for treating yourself! Close to National Theater of Catalonia, and a few steps from Sagrada Família by Gaudí, Ascot apartment is surrounded by music, arts and culture. The apartment itself is chic, spacious and quiet, with three bedrooms and two bathrooms plus a nice balcony too. This spectacular penthouse boasts a magnificent private terrace of 65 square meters, perfect for panoramic sunset views of the surrounding exclusive neighbourhood of Pedralbes. The floor to ceiling windows make it light, airy and pleasant. One of our popular Barcelona apartments for rent. A charming place in a new building in the neighbourhood of Eixample, this two-bedroom apartment is perfect for the curious traveller who yearns for a tranquil and calm place to rest after a long day of exploring. Full of ambience and affection, you’ll be sure to appreciate the special touches of Noname apartment, like the fringed curtains, separate dressing room, plus big comfortable L-shaped sofas. Combining romance with playfulness and comfort, KissMe apartment is like a first kiss… unique and unforgettable. A mix between modernity and comfort, all located in the center of the city in the modernist neighbourhood of Eixample. Not to mention the 85 square meter terrace which is perfect for sunshine filled breakfasts to start your day. This cozy apartment is located in a beautiful 19th century building. With warm accents of wood in the floors, ceiling beams and furniture, it almost has a country house feel, bringing you an oasis in the city center. With high ceilings, intricate detailing, and stained-glass windows, this luxury apartment will have you feeling like the rich and famous. Can be rented as a 5 bedroom unit, or combined with PDF Petit to make it a total of 8 bedrooms, making it perfect for large groups. With four bedrooms, three full bathrooms and a Jacuzzi, Red Carpet is fit for an A-list celebrity. 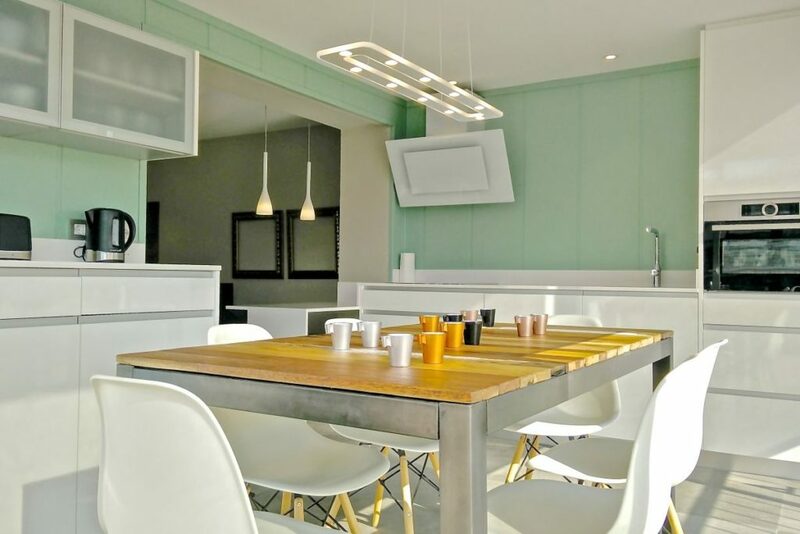 The spacious kitchen and dining table which fits 12 people, it’s the perfect space for hosting a memorable evening. Full of Gothic flavor, this apartment is decorated with wooden furniture, checkered fabrics, and rustic tables that create a warm atmosphere. Next to La Rambla and overlooking one of the most vibrant markets of the city, La Boqueria. Oriental apartment is full of sleek lines, polished surfaces and bright finishes. Located in the Born neighbourhood, Picasso apartment is in the artists’ district, a very chic area with many new cafes, restaurants and boutiques. The exposed stonewall and wooden beam ceilings add a rustic feel to the apartment. This state of the art apartment is equipped with leather Chester sofas and armchairs, plus comfortable queen-size beds. The crisp high quality linens and premium towels will give you that five star hotel feel. 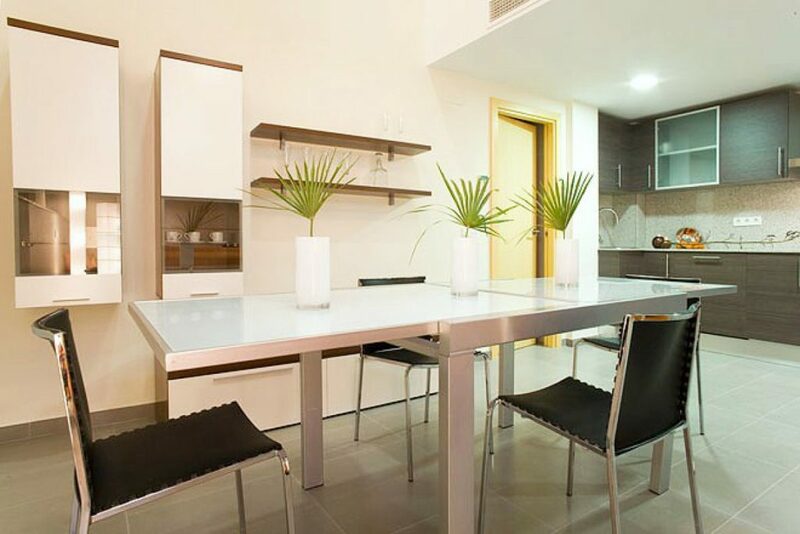 This executive style complex of apartments, is sophisticated and centrally located near La Rambla. Plus each bedroom comes with an ensuite bathroom. Located in the beautiful town of Sitges, this mountainside villa is one of the most elegant options for rent just 20 minutes away from Barcelona. With a garden area and a wonderful pool of 16 meters long, it’s perfect for a bit of afternoon reading or a quick morning swim. Located in a private residential complex, this two-bedroom apartment has a sunny terrace, a swimming pool surrounded by lush gardens, and also a barbeque available, plus a golf club nearby and common areas for tennis, ping pong or basketball. Perfect for families looking to wind down and relax. 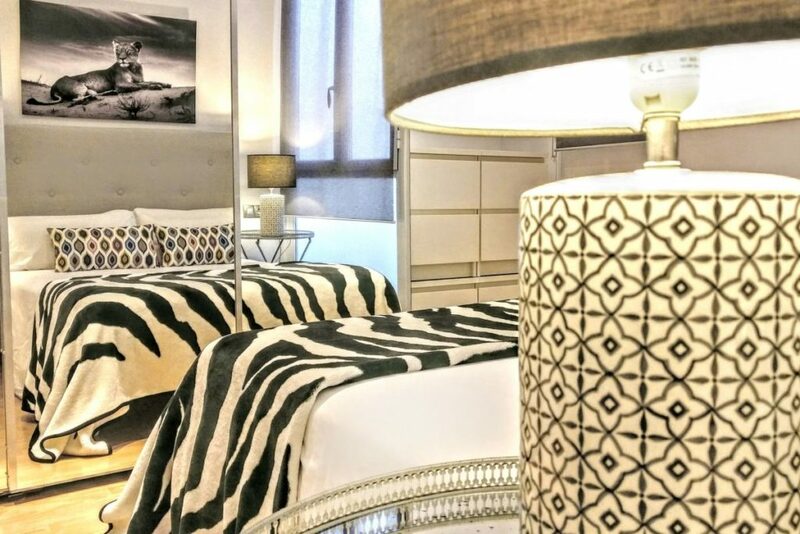 This large apartment breathes modernity and is perfect for lovers of music, with its proximity to the Gran Teatre del Liceu, a temple of music with international recognition, plus Plaça Reial just moments away. With spacious 1 bedrooms, 1 bathroom plus sunshine-filled terrace with wooden canopy and sun lounger, this Barcelona apartment for rent is a real gem in the district of Les Corts. Take advantage of the beautiful Mediterranean climate with morning coffees under the sun, high up on the rooftops of the city. Mixing design, original pieces of art and vintage touches, Macca is a contemporary apartment in a historic area, filled with light and comfort – just one of our many sophisticated apartments. 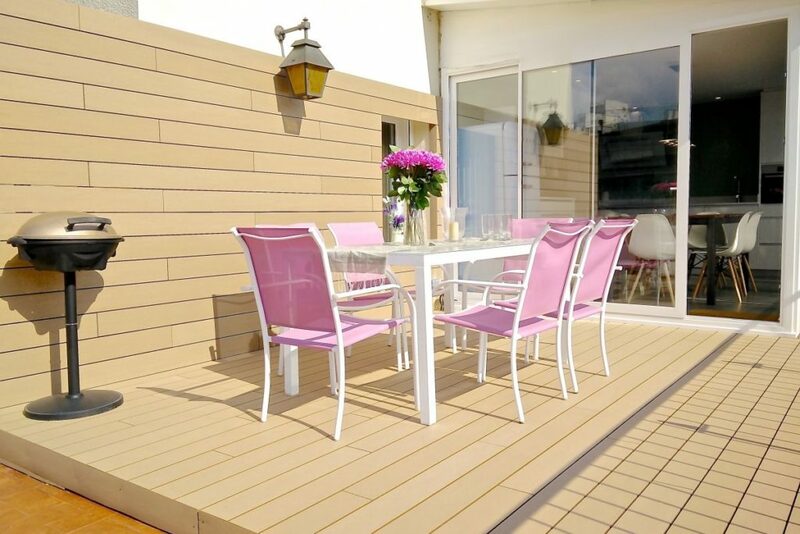 A bright penthouse, in the beautiful neighbourhood of Eixample area near Camp Nou, with the luxury of a private terrace. Exquisite, delicate and beautiful just like the Dandelion flower. This apartment’s privileged location guarantees sunlight throughout the day, and the natural light bounces off the many mirrors, making the entire apartment full of life. A warm and functional apartment, located in the heart of the city next to Plaça Universitat. With a nice balcony overlooking a quiet square, full of trees. Which BizFlats apartment would you like to stay at most? Leave a comment below to let us know. Want to see more Barcelona apartments for rent? Visit www.bizflats.com!